Need help deciding what type of internet service suits your personal or business needs. 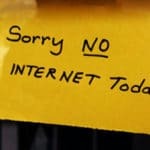 Are considering a change / upgrade to your internet service or ISP, but not sure if it’s worth it. Want to know the disadvantages / advantages of each different type of internet connection. Want to find out how different internet connections work. The video below by French Toast Philip explains each of the three main internet connection types available today. (As simply as possible). It can help you make a more informed decision on what type of internet service you should consider. Your internet is one of these three – cable, DSL or fiber because no one uses dial-up anymore. They do the same thing, which is provide you internet access. But they have their own advantages and disadvantages. So without further ado, let’s get right into it. Cable internet is a type of connection that transmits data through a cable television network through a coaxial cable. 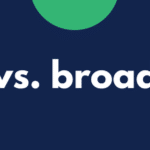 While cable is generally faster than DSL, its primary disadvantage is that you’re sharing bandwidth with neighbors who are using the same cable line. So during peak times where a lot of people are online, your speeds are going to slow down considerably. But on the upside, cable internet speeds are not affected by how far you are from your ISP or Internet Service Provider. DSL stands for digital subscriber line. It is a type of connection that transmits data over a telephone network through a telephone cable. DSL is the most popular connection in the world. Over 60 percent of broadband connections are DSL. 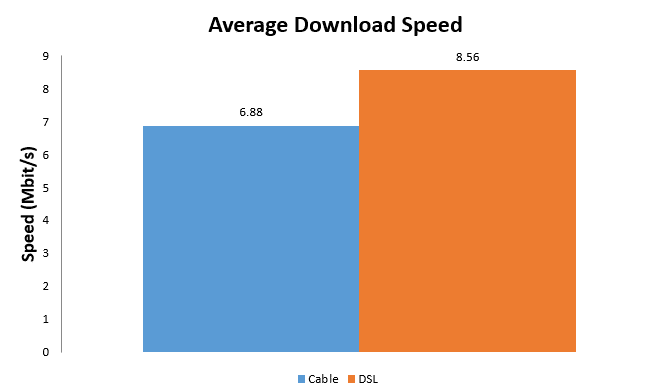 Unlike cable, DSL bandwidth is not shared. But on the downside, DSL internet speeds are affected by how far you are from your ISP. So the farther you are, the slower your speeds. There are two types of DSL connections – asymmetric and symmetric. Asymmetric offers higher download speeds than upload speeds while symmetric offers equal download speeds and upload speeds. Fiber optic communication is the future of data transmission. Data is transmitted through plastic or glass wires as light waves. Fiber optics offer the most potential for high speed data transmission and is the clear solution for our growing bandwidth needs. 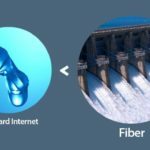 Its main disadvantage however is that fiber is expensive to install, which is the main reason why it’s still not very widespread today. Now let’s go over to what really matters and that’s their speeds. If you want to know more about internet speeds, I suggest you go watch my video about it by clicking on this link. DSL will give you between 128 kilobits per second to 24 megabits per second download speed. But speeds are constantly being upgraded. Like at the recent Broadband World Forum in Amsterdam where companies announced that DSL speeds will be boosted to one gigabit per second in 2016. Cable internet on the other hand will give you speeds of up to 150 megabits per second download speed. However, again, this is shared bandwidth. So during peak times, you’re going to get much slower speeds. Like DSL, cable internet providers are looking to provide gigabit internet in 2016. Fiber is really fast, like really, really fast. While DSL has yet to achieve gigabit internet speeds, fiber already has. Google Fiber is an internet and TV service that gives you speeds of one gigabit per second download and one gigabit per second upload. That’s 1000 megabits per second down and 1000 megabits per second up. With gigabit internet, you can download a whole album in one second. You can download a one gigabyte file or upload your one gigabyte YouTube video in eight seconds. But fiber doesn’t end there. 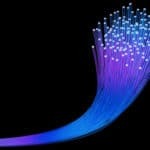 Researchers have achieved speeds of 255 terabits per second, which is about 32 terabytes per second. With that kind of speed, you can download a one-gigabyte file in 31.25 microseconds. Thirty-one point twenty-five microseconds. But 255 terabit and gigabit internet is far from being a commercial product like long, long term. As of now, Google Fiber is only available in 11 cities in the United States. But this is something to definitely look forward to. 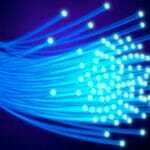 The applications of fiber optics are not limited to the internet. They also include telecommunications, cable TV and electricity transmission. Anyway guys, that’s going to be it for this video. Thanks for watching and I will catch you on the next one.